Maui’s nickname is the “Valley Isle.” It’s the second largest of the Hawaiian Islands with a land area of 729 square miles — 48 miles long and 26 miles across at its widest point. 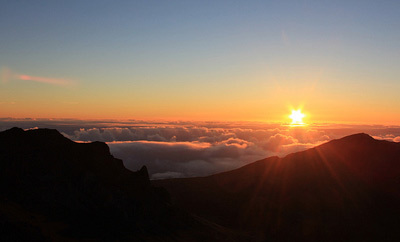 Haleakala National Park is the coolest — it can drop into the 40s or lower, especially at sunrise or sunset. Winter season lasts from November to April and is wetter, with temperatures in the 70-80s. Summer temperatures are mid 80s – low 90s. Ocean temperatures are mostly warm year round, sometimes reach up 80 degrees in the summer. Off-season: May, September and October (lower-priced airfare). High-season: All other months, especially in November and December (higher-priced airfare). Kihei is one of the most popular destinations on island, and it’s situated on Maui’s Sunny South Shore — hence our company name! Views of Kaho’olawe, Molokini, Lana’i and West Maui. Gorgeous beaches and world-class dining and shopping, including The Shops at Wailea. Several championship golf courses and tennis courts. Great place for an early morning walk or jog along the 2 mile beach path that skirts the resorts along the ocean side. A former whaling village and the old capital of the Hawaiian Kingdom in the early 19th century. Visit the 140 year old banyan tree that towers over almost an acre of downtown Lahaina. Local vendors sell their arts and crafts under its shade. Loosely translated to “arms embracing the sea,” Kapalua is a premier resort area located at the foot of the West Maui Mountains. Ka’anapali once served as a retreat for the ancient royalty of Maui. Whaler’s Village Shopping Center offers a variety of shops, restaurants and a whaling museum [link]. 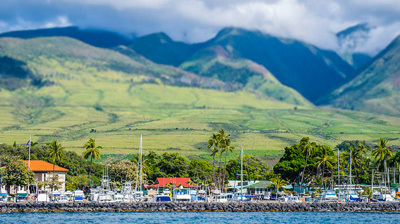 Hana is a small, unspoiled town at the end of the highway on Maui’s rugged northeast coastline. Not many journeys are as beautiful as the Road to Hana. The drive: 52 miles from Kahului / 60 miles from Kihei and takes between 2 and 4 hours due to 59 famous one-lane bridges and 620 turns (several hairpins!) and inevitable photo stops along the way. Scenery is magical: lush rainforests, waterfalls, rugged coastline and more. Several hikes along the way. For maximum adventure, we recommend leaving early (6-7am) with a cooler full of drinks and food. 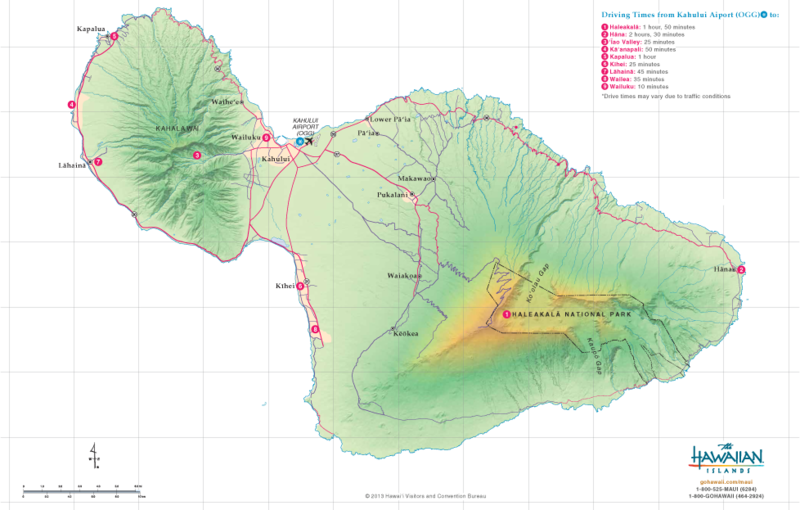 Haleakala is a massive, 10,023 ft. shield volcano whose name translates to “House of the Sun” in Hawaiian. 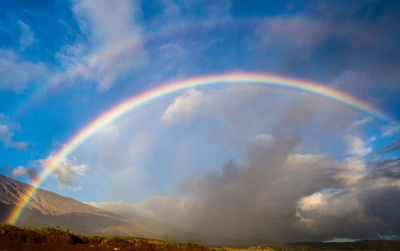 According to a Hawaiian legend Maui, a demigod lassoed the sun from its journey across the sky as he stood on the volcano’s summit, slowing its descent to make the day last even longer. Haleakala is a US National park and home to several rare and endangered species, with many restoration and preservation efforts underway. Park weather: is unpredictable, with temperatures in 40s and 60s, but also very chilly during high winds. Always bring layers of clothes with you! Park activities: star gazing, bird watching, hiking, horseback riding and camping. Sunrise at Haleakala: You can drive atop the highest peaks of Haleakala to the Haleakala Visitor Center and watch the sunrise. The drive to the summit can take 2-3 hours and be prepared that it will likely be 30-40 degrees cooler than Kihei. You can also ride down from the summit on a bike – several organized tours are being offered – these must be booked ahead of time. 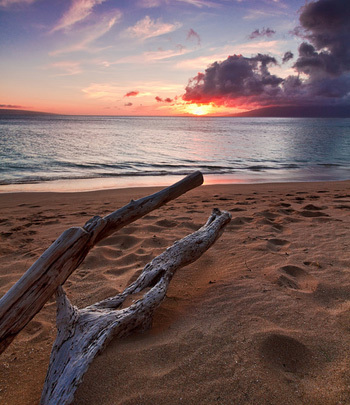 There are 81 accessible beaches on Maui and 39 have public facilities. We can’t really say there’s a “best” beach because all of the beaches are pretty awesome. Kalepolepo is a small and lovely beach — a nice escape for a low-key BBQ or sunset. The area was the choice of kings. An ancient Hawaiian fishpond surrounds the water, making it calm and great for kids. Locals also fish here. Located in the North end of Kihei, Sugar Beach stretches more than three miles and runs all the way around to Ma’alaea. Be sure to explore the tidepools! 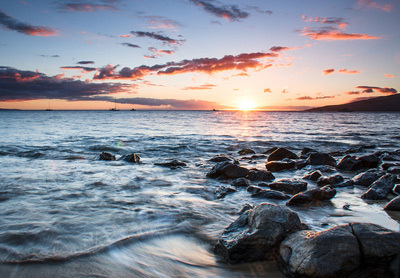 These three beaches are some of the most popular and busiest beaches in Kihei. Kamaole I especially is popular for its white sandy bottom and ideal swimming conditions. Each beach offer full amenities, including (good) parking, restrooms, showers and lifeguards. Right in Kihei — on Maui’s South Shore — Charlie Young beach is the Northern extension of Kamaole I. It’s also known as one of the best places to learn how to boogie board or surf. The water is warm and shallow. 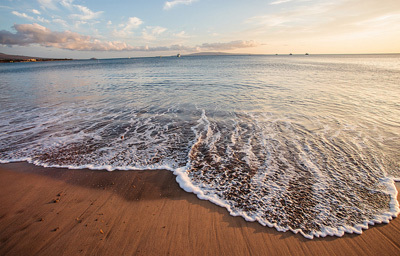 Keawakapu borders of Kihei and Wailea and offers excellent swimming and snorkeling. It is lesser known but just as beautiful as the Kamaole Beaches. Wailea Beaches front the main resorts on South Maui — from the Andaz to The Fairmont Kea Lani. They all have white sand beaches with lava flows creating natural reefs teeming with marine life. Waves here aren’t too big, which make for great snorkeling. 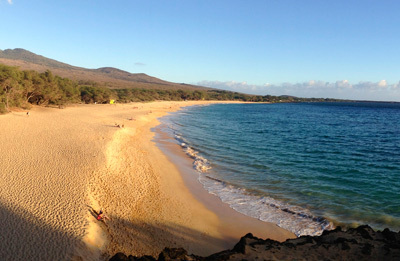 Makena Beach is one of Maui’s most popular and photogenic beaches and it’s huge: over a mile long and a 100 yards wide. The waves here are usually big, so please exercise caution while playing in the water. On the North side of Big Beach, just over the rocks, is Little Beach. It’s more sheltered and less windy, and a good place for all-over tan (clothing is optional!). Secret Beach is kind of secret, like the name implies. It’s past Makena Big Beach, and if you keep on the lookout, you’ll find this tiny beach hidden behind a wall with one small entrance. Planning a beach wedding or a proposal? This may just be your spot — it’s small (about 100 yards), with velvety soft sand and palm trees for shade. Rock pools surround each side and the middle. Secret Beach isn’t for swimming, but kids can enjoy tide pooling. This awesome snorkeling and surfing beach is located close to mile marker 14 on Honoapiilani Highway. The beach itself runs next to the highway for about two miles. Ho’okipa is world famous for excellent surfing and windsurfing, with waves reaching 30 feet in the winter. If you’re in Paia, it’s a must-see. Known as one of the Best Beaches in the world, Kapalua Bay offers unrivaled sunsets, snorkeling and swimming. How does half a mile of fluffy white sand sound? This popular Kapalua beach has amenities such as restrooms and lifeguard station. This somewhat-hard-to-pronounce beach in Hana has black sand and is a must-see for its raw beauty. Large waves make swimming a challenge, so it’s probably better for looking. 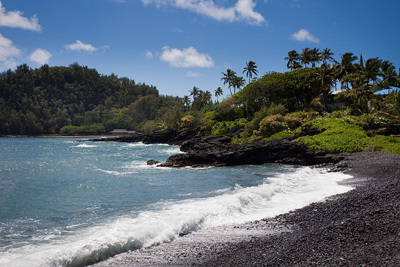 The large crescent shape of Hana Bay is fairly protected, leaving calm and approachable water. It’s popular with families and picnics, and offers restrooms facilities and showers. Morning hours are ideal before the wind picks up. Don’t ever turn your back to waves when you’re on shoreline. When in doubt — don’t go out.